Even though Lehigh isn't taking on any FBS teams this season, it's not too early to take a look at the 2016 college football schedule and look at some of the games that pit FCS teams vs. FBS teams and look for potential upsets. Recently, Craig Haley over at Stats picked his Top 15 FCS vs. FBS matchups. All around the college football landscape, college football prediction season has begun, analyzing way-too-early Top 25s, and projecting positional battles in preseason camp. For the overall world of the FCS, though, leading into the season there are few things more exciting than a Jacksonville State putting The Fear Of The Big Guy Above into Auburn, or Portland State delivering probably the most humiliating upset on FCS over FBS history over North Texas. So where should we be looking this year? Consistent FCS success. It is generally no accident when an FCS teams upset or challenge an FBS opponent - generally, the teams that you think are challengers for the FCS postseason are the same ones that are good threats to pull off the upset. Examples like Portland State, who came out of nowhere last season to pull off not one, but two, FBS upsets are rare - generally, it's pretty well known who the title contenders are. FBS teams in a rebuild. To me, it's not so much whether a team is in the preseason AP Top 25 as whether the team is replacing something major on their team, such as a head coach or quarterback. It takes time for an FBS team to sometimes find its feet - and that's where a hungry, strong FCS team can strike. Sneaking Up On Them. Reputation generally isn't a good thing when it comes to FCS upset candidates. The less hype they've received, the better (think: Appalachian State over Michigan). This doesn't always apply (see: North Dakota State against all sorts of FBS teams), but in general it works. "Power" vs." Non-Power". Time and again, it gets proven that teams in "power" FCS conferences are not all that different than those in G5, or "non-power" conferences in FBS. In fact, some FBS teams would probably struggle to reach .500 in, say, the Missouri Valley Football Conference or Big Sky Conference. Though these types of matchups are more rare these days, they do crop up occasionally, and are great picks. So without further ado, in order of likelihood, here are six games that are my picks as potential upsets, and six more that are on the fence. North Dakota State at Iowa. You'd have to be a fool to overlook the five-times-consecutive FCS champions, even without QB Carson Wentz, leading the Bison anymore. North Dakota State has become synonymous with FCS success. They will be the preseason No. 1. They will be good. They'll be the team to beat in the Missouri Valley. But that's just it: Iowa, who is a preseason contender for "that other College Football Postseason Playoff thing that happens around New Year's Day", seems so unlikely to overlook the Bison that it feels a lot more like a longshot this time around. Don't get me wrong - I'll still be paying very close attention - but I think this will be a very different type of matchup for the Bison. Wagner at Boston College. This matchup pretty much has everything I look for in an upset candidate: epically bad offense (check), dregs of the ACC (check), probability that the opponent will take the opponent lightly (check). Additionally, even though Wagner comes out of the limited-scholarship NEC, they've been in this situation before: they came very close to upsetting Florida Atlantic in 2012, taking the Owls pretty much the distance in a 7-3 defeat. But I'm having a hard time believing that of this year's Wagner team, who finished 1-10 last season and are in serious rebuilding mode under head coach Jason Houghtailing. Still, Wagner should be better in 2016 after 2015's Year One rebuild, and don't count out Boston College's near-complete inability to score. This game could be a lot closer than you think. UC Davis at Wyoming. Pity Craig Bohl. No, on second thought, don't. The Cowboys, led by the former head football coach at North Dakota State, haven't enjoyed the same success under Bohl as the Bison had, to put it mildly, experiencing a depressing 2-10 season last year lowlighted by a loss to another Big Sky team, North Dakota. Could UC Davis make it two in a row for the Big Sky? If they weren't in the middle of their own rebuild under head coach Ron Gould, coming off a 2-9 record, I'd like their chances a lot more. Also, Wyoming won't be entering into this season the same way they were last season, where they had a boatload of transfers (including at QB). It's unclear how much Bohl's team will improve from last season, but they should be improved enough to get past UC Davis. But I could see Davis keeping this closer than people realize, which puts this on the watchlist. Eastern Kentucky at Purdue. Dear Eastern Kentucky: I so want to pick you here. You return experience at key positions such as QB (Bennie Coney), and the secondary (Kiante Northington). You face a Big 10 team that looks vulnerable, Purdue, who, under fourth year head coach Darrell Hazell, doesn't look like they will be back in the Rose Bowl anytime soon. Yet something holds me back. I'm not sure whether it's the fact that you're breaking in your own new head coach, Mark Elder, or whether it's that Purdue has never lost to an FCS team (with two of those wins also coming against EKU). I fully anticipate the Colonels, who always have the expectation of competing for the OVC title, to be in the thick of the title race - and I'll be watching. To me, this one feels like a close, but no cigar, effort by EKU. Villanova at Pitt. Another team I'm dying to pick is Villanova, who certainly want to be sending Andy Talley a beautiful present in his Wildcat farewell tour. Beating an old Big East foe, not to mention one that was a perennial thorn in the side of the basketball team, would be a real treat for Talley and his team. But Villanova, who is replacing QB John Robertson and OL Jake Prus, will have a job on their hands putting together a team to beat a team that is expected to compete in the ACC this year. I wouldn't rule out Talley pulling another John Robertson-esque contributor out of his hat this year, but it seems like asking for a Pitt upset might be too much to ask. Rhode Island at Kansas. Looking over the Big 12, it's no secret that the perennial basement-dwelling Jayhawks will likely struggle in their division, and struggle to win football games overall. Normally this would be a fantastic indicator for an FCS upset - if they weren't facing off against their FCS doppelganger, Rhode Island. The Rams have a combined five wins in the last three years. The key in this game might be punting. Which punter will hold onto the ball best? Which one is marginally less likely to fumble and give their opponents a 2-0 lead? "If You Squint, You Can See the Vandals Down There"
6. Montana State at Idaho. Call this the "Tumultuous Offseason Bowl." With Idaho's offseason - you know, the one where the Vandals announced they were transitioning back to FCS - you have to think they are hating the fact that their first opponent for the 2016 season will be a future conference opponent in the Big Sky. 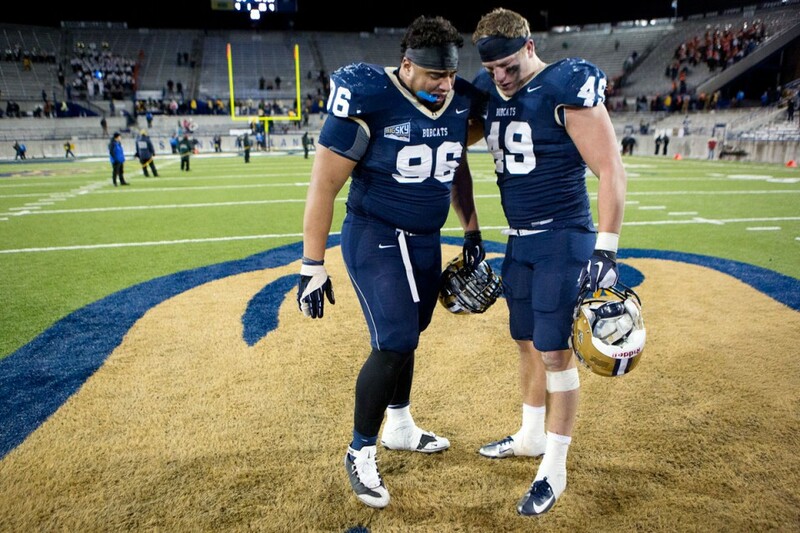 Montana State's offseason hasn't been much calmer, either. The Bobcats fired Rob Ash after a very disappointing 5-6 season and saw QB Dakota Prukop become Oregon's latest rent-a-QB-from-the-Big-Sky, following QB Vernon Adams, Jr,'s successful stint there last season. Normally, not exactly a great case for a FCS upset. The key in this game, though, is that even a rebuilding Montana State should be much better than an Idaho team that will be struggling to compete in any college football game next season. Even with a new QB, Bobcat head man Jeff Choate will have no problem motivating his team to go out to Moscow and re-establish Montana State as a title contender in 2016, especially considering Idaho will be a future conference opponent. At best this season, Idaho was going to struggle. The latest news will make it harder for them, while handing Montana State a huge opportunity to take a Big Sky stand on their future conferencemate. Whether Montana State competes for a playoff spot or not, it should be the perfect scenario for a Bobcat win. 5. UT Martin at Hawai'i. It's no secret that I love picking against FBS schools in trouble, and Hawai'i fits that bill perfectly. With public debate on whether the Rainbow Warriors should continue sponsoring FBS football, the entire athletics department operating deep in the red, and a brand-new head coach in his first year, Nick Rolovich from Nevada left to recruit in this environment, Hawai'i will almost certainly be bad. Bad enough to lose to UT Martin, though? They lose their starting QB from last season, but an offensive line led by pro prospect Jackson Roberts should make that transition a lot easier to the next generation of Skyhawk QB that it might initially seem, along with talented WR Caylon Weathers. They'll have a good chance against a team that would struggle to compete in the OVC, and as long as they can keep their minds off the beaches and on the playing field, I think the Skyhawks could definitely win this game. It bugs me a little to pick Colgate here, and not only because I am still reliving their goalline stand last season to deny Lehigh a chance at the Patriot League title. But this isn't some non-scholarship Raider team that will get railroaded by the Orange. Last year, Colgate, under coach Dan Hunt, ended the season on a tear and also, for good measure, knocked out two CAA teams in the playoffs (New Hampshire, 27-20, and James Madison, 44-38). Until their run was halted at Sam Houston State, there was no hotter team in FCS than Colgate, and with so little graduating, they will be a potentially tougher out in 2016 than they first might seem. Additionally, the Big Maroon Machine return QB Jake Melville and RB James Holland, who were a huge part of Colgate's playoff success. Why shouldn't they have a better than even chance against a potential ACC cellar-dweller with a first year head coach? 3. UNI at Iowa State. Speaking of potential cellar-dwellers with new first-year head coaches... Hey there, Iowa State! We all already know UNI is a "power conference" team, making the playoffs yet again out of the Missouri Valley Football Conference. They check all the boxes - returning starting QB (Aaron Bailey), Top 25 team, solid returning players on offense and defense. The only possible hitch? Last season, one of Iowa State's few wins came against the Panthers. Matt Campbell, who takes over after a rough 3-9 season for Iowa State, has to effectively start over on offense for the Cyclones, including almost complete turnover on the offensive line. 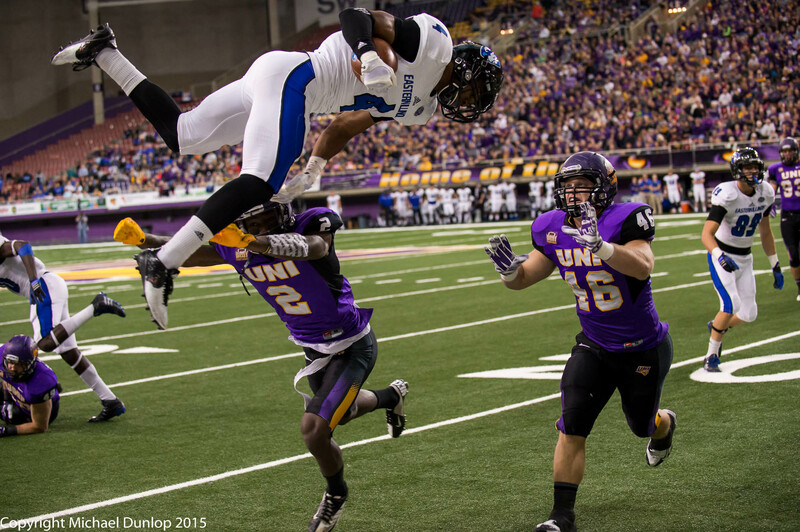 If you think that's not great news for UNI's defense, who haven't given up more than 28 points in a game in their lat eight contests, you haven't been paying attention. You can imagine the family dinner discussions this summer with Panther head coach Mark Farley, and his son, LB Jared Farley, talking about how to pressure Iowa State's QB and stuff the Cyclone running game. 2. Eastern Illinois at Miami (OH). Arguably the worst team in FBS the last two seasons, head coach Chuck Martin took the words "youth movement" to its logical extreme when he got there in 2014. In two years, after installing mostly "his guys", a team filled with freshmen and sophomores limped to a 5-19 record. The Panthers. behind DT Jarvis Williams and RB Jalen Church, have exactly the senior-laden team that should give a mid-range (at best) team in the MAC fits. The team made strides last year and made it into the FCS playoffs, very much fit the bill as an upset-maker. It's admittedly a high-risk, high reward pick, because Miami (OH) won't be a team that is short on experience, and they could be a lot better than advertised. Eastern Illinois, though, could be, too. The Spiders surprised many by making a deep run in the FCS playoffs last season. 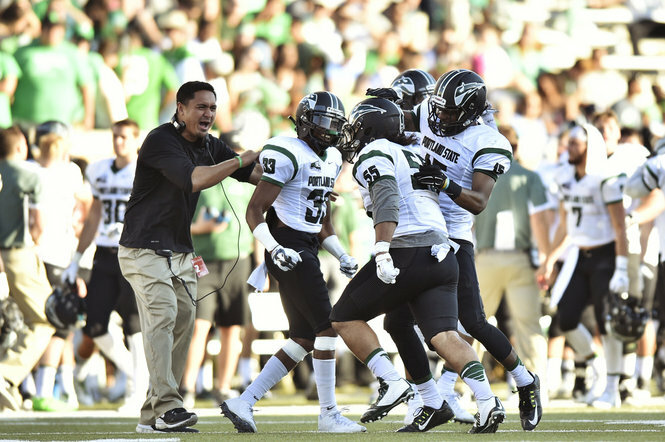 Head man Danny Rocco, finally with the FCS playoff monkey off his back, is looking this year to take it a step further - field a team that can win the whole enchilada. QB Kyle Lauletta, last seen running through mammoth-sized holes created by the Spiders' offensive line, returns, as well as leading receiver WR Brian Brown. They'd be a very tough out for the Cavs, even if Virginia were predicted to be very good this year. They're not. Virginia head coach Bronco Mendenhall is in his first year at UVa, and adding to their struggles is the fact that the offense is unsettled at both QB and RB. Making matters worse, the Cavs own athletic department seemed to throw all of the sophomore teams under the bus when they said, "Mendenhall routinely played true freshmen at BYU, and he expects to do the same at Virginia." This doesn't sound like it will end well for Virginia when they open the 2016 season.